I'm definitely someone that believes that things happen for a reason. Even from the most hideous events, a lesson can often be learned. 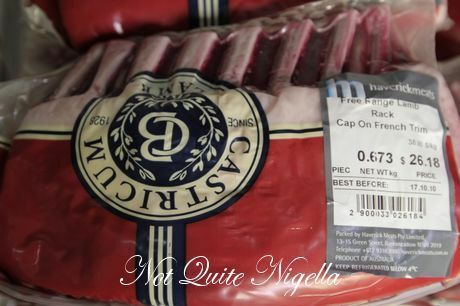 In the case of the recent global turmoil, one trend that resounded with many was people saving money by shopping for things in bulk or at less expensive wholesalers which allowed them to enjoy the food that they had always liked, but at a better price. 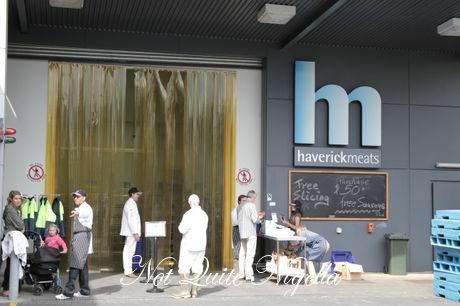 Haverick Meats is one the largest food service distributors in Australia that sell over 20 tonnes of meat a day supplying meat to Bilson's, Est, Sepia, Manly Pavilion, Assiette and Tetsuya's. 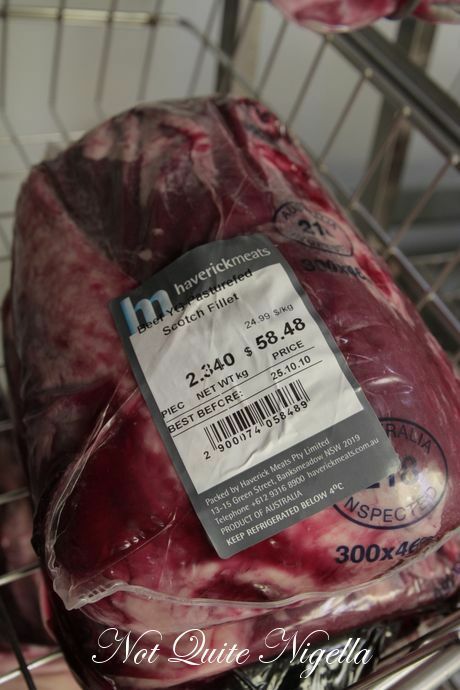 Started in 1962 as a butcher shop in Paddington it now supplies meat to restaurants, airlines, cruise line and entertainment venues-Qantas First Class passengers eat the meat from Haverick's and they have the largest inventory of dry aged meat in Australia. Because of customer demand, they have now started selling to the public from their warehouse in Banksmeadow in an industrial estate. We arrive there one Saturday afternoon and see their trucks everywhere. 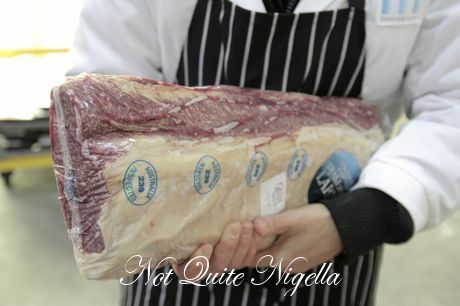 They are finding that customers choose to buy their whole primal cuts which they then offer to break down for them for free. There is also a trained chef Detlef Haupt on the premises at all times that can help buyers with any cooking questions. 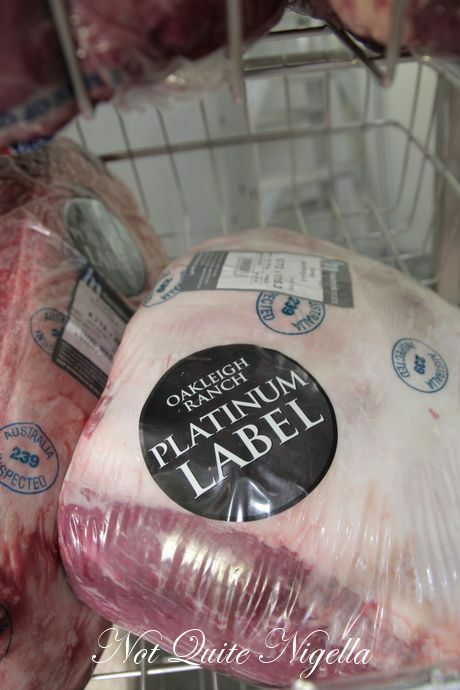 The prices are often lower than what you may find at supermarkets but the main distinction is the quality of the meat you can get. They have Wagyu, grain fed and grass fed beef, suckling veal and pig, La Ionica, Barossa Valley and Glenloth chickens, rabbit, goat offal, pheasant and spatchcock. All of their pork is free range and female pork only. The piece de resistance for me at least is their dry aged steaks. 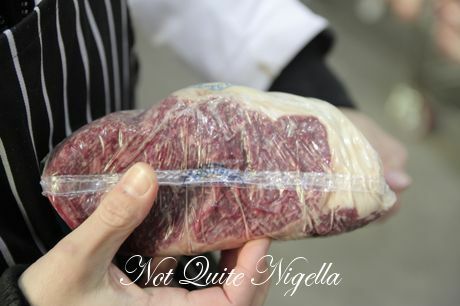 Dry aged for five weeks in their custom built dry aging room, the cuts of meat are tender and full of flavour which is why steak connoisseurs prefer a dry aged steak. And then....there's the Tomahawk. When Peter first mentioned the tomahawk I thought that it sounded like a cute name for a steak. And then he brought it out. Holy Tbone! I don't think I'd even know how to cook that. It certainly wouldn't fit into any of my pans! This retails at some restaurants for $150 and is meant to be shared between 2-3 people. 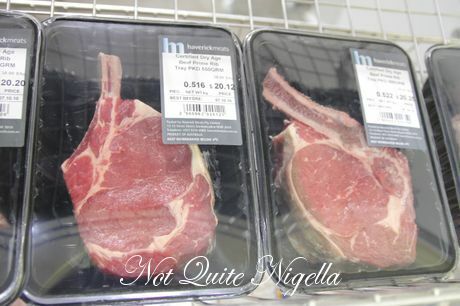 Here it is $36.90 a kilo which makes each tomahawk about $56. 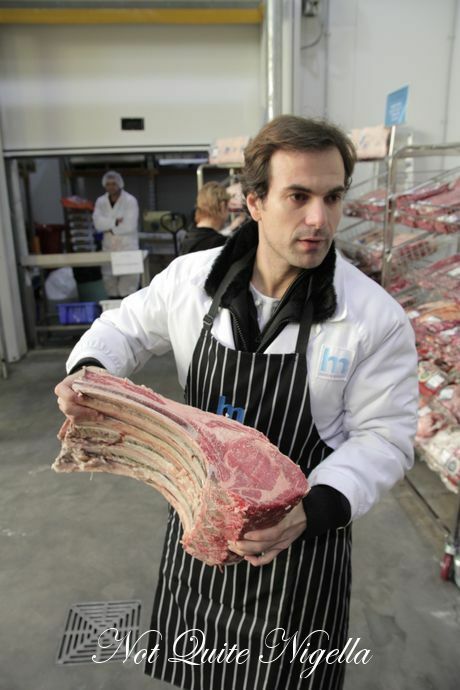 Peter also shows me the most expensive cut of meat, the 9+ marbled Wagyu beef which sells for $140 a kilo. Only top restaurants like Rockpool Bar & Grill would buy a steak of this marbling and you would expect to pay $120 for a 200gram fillet. We do a quick tour of the dry age room (sorry no photos allowed) which has shelves and shelves of meat dry aging, the flavours collecting and the meat tenderising. They have a camera in their dry aging room which allows them to watch the meat drying (although I don't know if it's particularly riveting tv if you know what I mean ;) ). 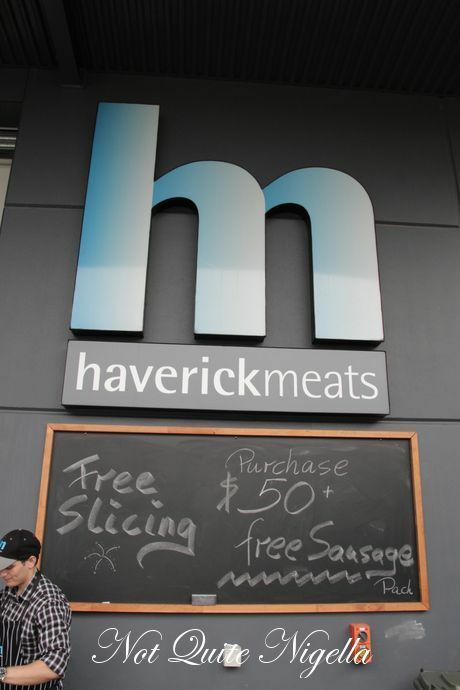 Haverick's currently has a special where if you spend $50 you get a packet of sausages for free. 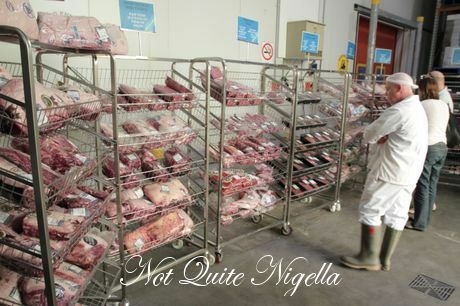 In addition to this, Not Quite Nigella readers can get an additional 10%! Just print off the first page of this story! And look out for an upcoming giveaway where you could win $150 worth of meat-that's right you could win your very own Tomahawk party! So tell me Dear Reader, how do you like your steak done? featureMamma's got a pretty, new Kitchenaid cover! 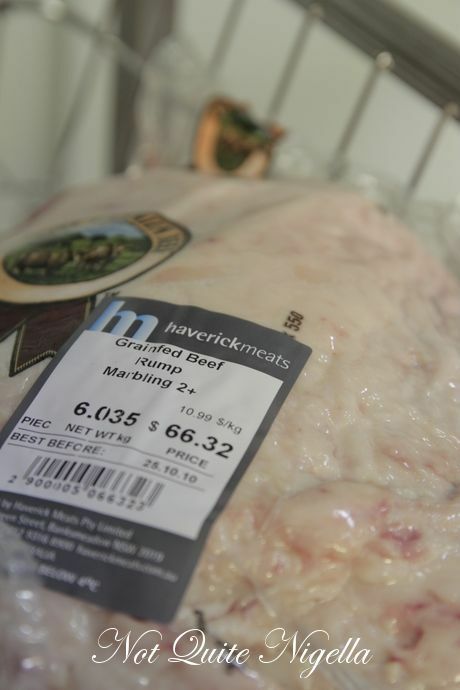 featureWin a $150 Gourmet Meat Voucher at Brookvale Meats! restaurantMaille Mustard Boutique, Mosman & Win A $500 Pot of Maille Black Truffle Mustard! feature Mamma's got a pretty, new Kitchenaid cover! 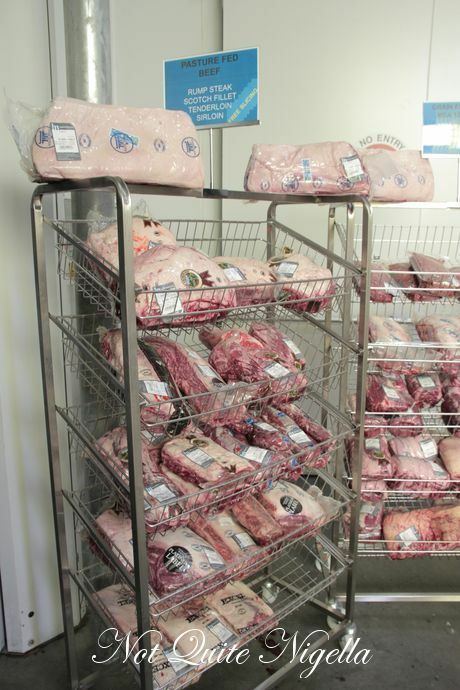 feature Win a $150 Gourmet Meat Voucher at Brookvale Meats! restaurant Maille Mustard Boutique, Mosman & Win A $500 Pot of Maille Black Truffle Mustard!